Image from: Decision of the Reserve Bank Organization Committee Determining the Federal Reserve Districts and the Location of Federal Reserve Banks Under Federal Reserve Act Approved December 23, 1913, page 9. The Reserve Bank Organization Committee (RBOC) was established by the Federal Reserve Act, December 23, 1913. 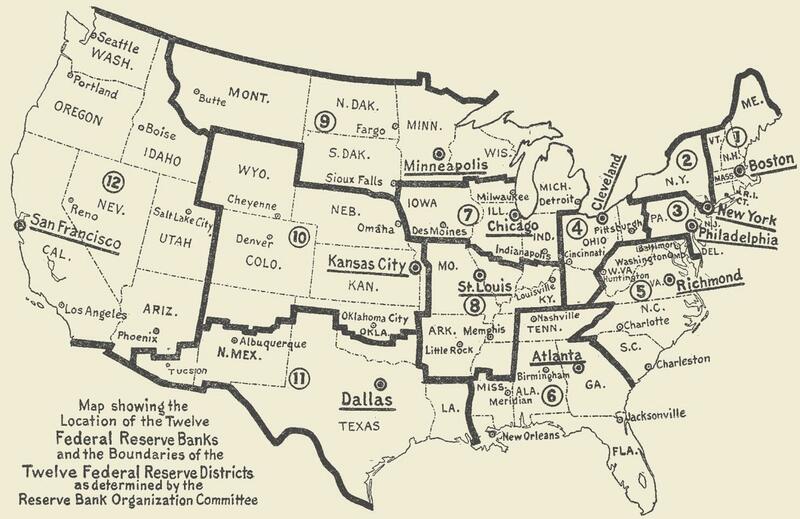 The RBOC designated the Federal Reserve cities, divided the United States into Federal Reserve Districts, supervised the organization of District Federal Reserve Banks, and prescribed regulations for the acceptance of the Federal Reserve Act by all national banking associations and participating banks. The RBOC was discontinued after the tasks assigned to the committee were completed in May 1914. This theme highlights documents by and about the initial organization of the Federal Reserve Banks, including a large collection of archival materials from the National Archives and Records Administration.